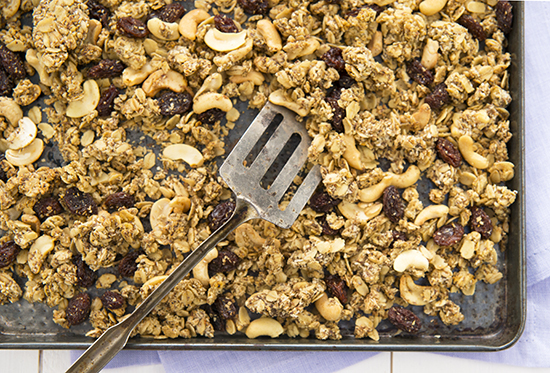 A Dash of Compassion » Curry cashew savory granola from OATrageous Oatmeals + a giveaway! You know how sometimes you realize a simple ingredient in your pantry is not actually totally boring and, in fact, is more versatile and boasts a number of redeeming qualities that you suddenly develop a little crush on it? Yeah, that happened to me. In recent years, I’ve come to see oats in a whole new light. Like, I went from childhood breakfasts of Quaker instant oatmeal packets to making awesome stuff out of oats like oat milk, oat flour, overnight oats and homemade granola—which is why I was so excited to see Kathy Hester’s new book, OATrageous Oatmeals, land in my mailbox. Think of this book as a manifesto to oats, going beyond recipes you would think traditionally require them and inspiring new ways to use this simple yet versatile grain. I love that Kathy also takes into consideration a number of common allergens and special diets, and includes variations and additional information in each recipe, including soy-free, gluten-free, no added oil, sweeteners alternatives, and nutritional information. The easy oat milk yogurt—yes, that’s right, you can make yogurt out of oats! This was a very simple recipe that didn’t require anything more than rolled oats, water and a little plain non-diary yogurt. You have to cook it and then allow it to ferment overnight, but the result is a smooth, deliciously oaty yogurt that is far superiour (and much cheaper) than any store-bought brand. Mine turned out a bit thinner than the store-bought stuff I love so much, but that may have been an error on my part. I’ll be giving it another try soon! These butternut squash maple walnut scones came together quite easily and made an awesome breakfast paired with homemade strawberry chia jam. Since I didn’t have butternut squash on hand, I followed the variation using pumpkin puree instead. I shared these with my colleagues and they got rave reviews. The curry cashew savory granola is one of those recipes that piques your interest immediately, so it happened to be the first recipe I tried from this book. I dug out my favourite brand of garam masala spice blend and boy, did it make the house smell amazing—that incredible, warming scent of homemade granola combined with fresh Indian spices. I added some larger cashew pieces for more crunch and I couldn’t stop snacking on it while trying to take photos! Needless to say, I’ll be doubling the batch next time I make it. 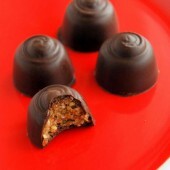 Find the recipe for this awesome, crunchy snack below! Pour the mixture onto the prepared cookie sheet and press thin. You should have one large, flat piece about 1/4 to 1⁄8-inch thin. Bake for 20 to 25 minutes, until the edges are browned and the middle is no longer wet. Let cool on cookie sheet and break it up into large or small chunks with your hands. Use to top salads or plain yogurt, or just eat by the handful for a snack! 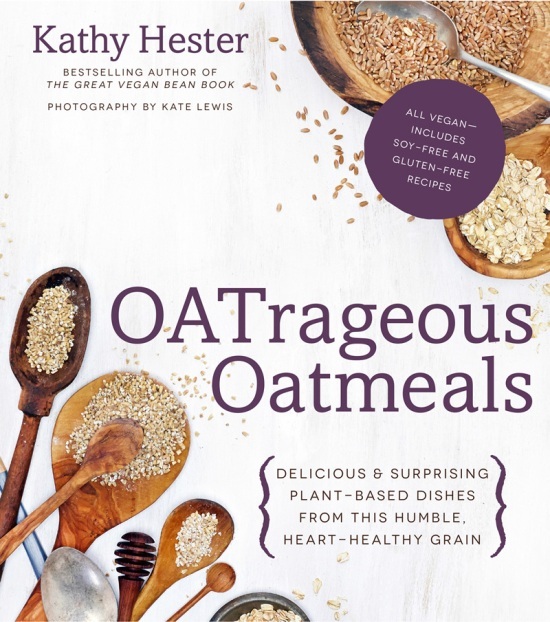 Kathy and Page Street Publishing have offered to let me give away a copy of OATrageous Oatmeals to one of you! The giveaway is open to Canadian and US residents and will run until Monday, November 10, 2014. Please use the widget below to enter. Yum! I’ve been reading so many great reviews of this book. At first I thought I wasn’t that interested – but the vast array of recipes and ideas are really making me curious! So far, my favorite thing to do with oats is just eat oatmeal … which is why this book sounds so interesting to me! ha ha. 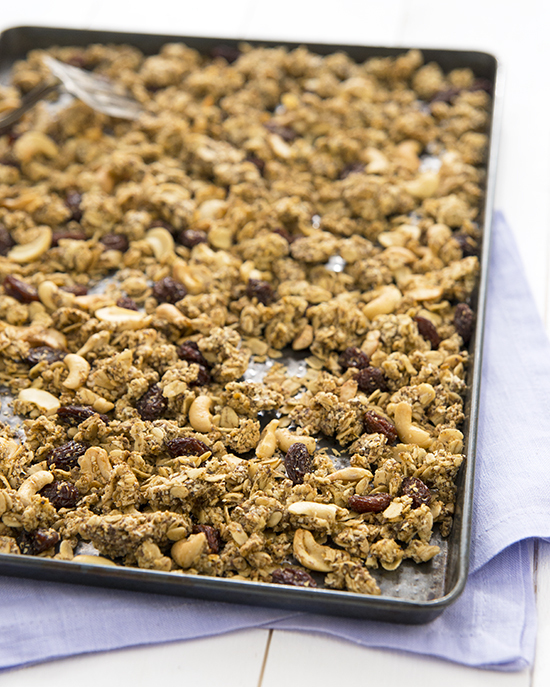 I love throwing some in a smoothie, but my favourite use of oats is homemade granola! Muffins and burgers are my favorite ways to use oats! I like to use oats in cowboy cookies (oats, chocolate chips, shredded coconut , etc). This book seems to have the key to becoming so much more creative in how I use oats! Still, I already use them in lots of ways, among which my favorite might be using them as the main ingredients in fruit crisp toppings. I think I eat oats almost every day — whether it’s granola, oatmeal, or ground into a flour — I love oats!! So boring and cliche, but I really can’t get enough granola. I use oats mostly for making myself breakfast in the morning – usually baked oatmeal in a mug, or sometimes I’ll make a big batch baked in the oven or over-night in the slow cooker. 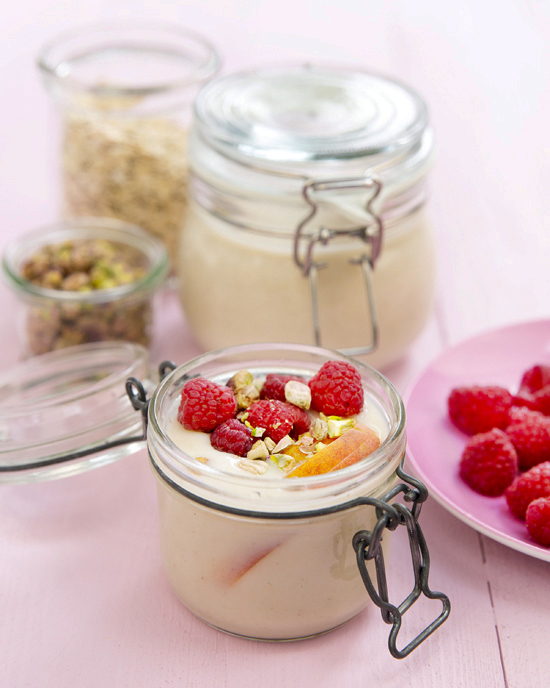 In the summer time I’ll do over-night oats in the fridge for a cold breakfast the next day. I like a simple bowl of oatmeal topped with almond milk, nuts and goji berries…and maybe a little shredded coconut! 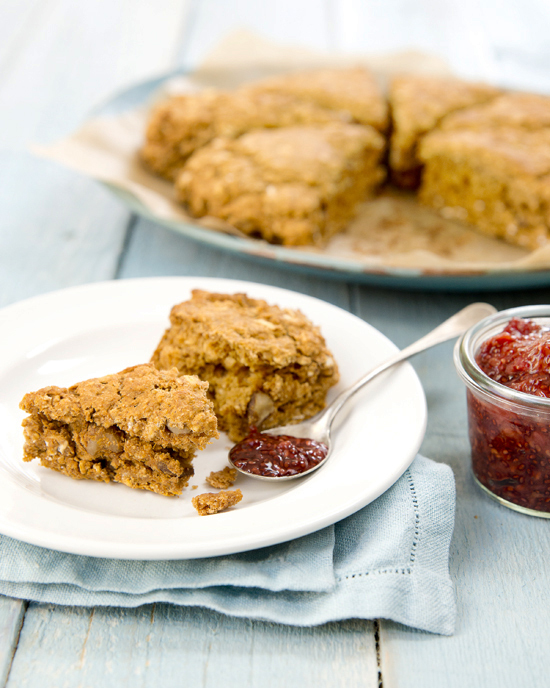 My favorite way to use oats is in a berry crumble. So delicious! Tough to pick just one fave! I do have to say that I love the magic and ease of overnight oats. I love how I can change up the flavours and have an amazing healthy breakfast in the morning. I love savory oats for breakfast–usually cooked in broth with broccoli and carrots. Mmm. I have always prefer oat to all other cereals. I use oat flour or flakes in most recipes. However, I made a few trials of oat yogurt and I didn’t like it. 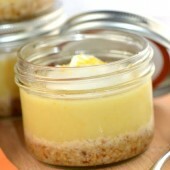 I have much more succes with homemade coconut yogurt! 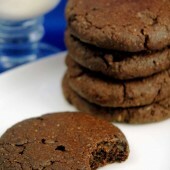 I love grinding them up to use as a healthy substitute for flour in my baking. Recently I’ve been using oats a lot to make flour for cookies. I also love adding them to smoothies! my current favorite is to make overnight oats with oats (of course), puréed pumpkin, almond milk, chia seeds, a couple of chopped dates, coarsely chopped almonds and some cinnamon. in the morn, warm up hen add some chopped honey crisp apples and another splash of almond milk … I can’t get enough!